"Even my Dad had a hard time finding a place when he and my mother were first married...Momma was pregnant with Berenice, and he went to a woman who had a house. He asked if they could rent a place. She said, no, she couldn’t rent to Jews. Dad said, 'Well, now I know why Jesus was born in a manger.'" 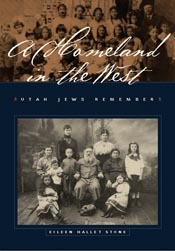 Rather than a history of Utah Jews, this is a book of Utah Jewish histories. A Homeland in the West collects the stories and the voices of men and women drawn west by choice or by chance, people who made their way and earned their living in a culture often alien, occasionally hostile, sometimes welcoming. These are the stories of immigrants and explorers, artists and merchants, senators and soldiers. Culled from countless hours of oral histories comprising more than ninety current and archived interviews, Eileen Hallet Stone has gathered reminiscences that tell a tale of life in Utah from a seldom-heard perspective. These singular threads—supplemented with stirring photographs, traditional recipes, and a Yiddish glossary—weave a rich and varied tapestry of Utah’s enduring Jewish heritage. • Solomon Nunes Carvalho, who was invited by Colonel John C. Frémont to join his final, near-fatal expedition across the Rocky Mountains in search of a viable route for the country’s first transcontinental railroad. • The Auerbach brothers, who opened their first store in Salt Lake City in 1864 and who, by 1883 saw it become a mercantile enterprise worth half a million dollars in sales and real estate. • Simon Bamberger, who was elected governor in 1916—the first Democrat, first non-Mormon, and only Jew to hold the office. • Anna Rich Marks who made a fortune in real estate and mining and who at one point held the representatives of the Denver and Rio Grand Railroad at gunpoint—demanding they pay her price to cross her land. • Joel Shapiro, who, as a soldier during World War II, found himself in the detachment from his unit assigned to join the liberation of the Dachau concentration camp. With their own voices, in their own words, A Homeland in the West speaks to the dichotomy of living as 'gentiles' in Mormon 'Zion,' testifying to the ways in which memory and tradition, lifestyles and legacies layer together to form the whole of a person, the whole of a community. Eileen Hallet Stone is a Utah-based journalist and current editor of the Graphic Arts Journal.